Manila, Philippines – Recognized for its success in providing exceptional Corporate Social Responsibility (CSR) programs, leading BPO and IT solutions provider TELUS International Philippines recently won its first Anvil Award for its TELUS Days of Giving program at the 53rd Anvil Awards held at Shangri-La at the Fort in Taguig City. The TELUS Days of Giving is the company’s most impactful CSR program that involves annual and weekly CSR activities where thousands of team members (employees) and senior leaders from across its five sites work hand-in-hand to build houses, revamp elementary schools, visit orphanages or homes for the elderly, and engage in other noteworthy charitable activities. 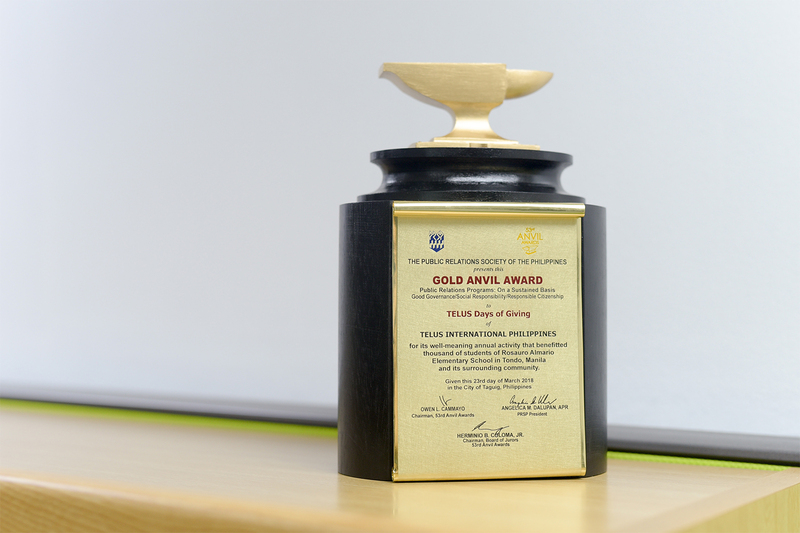 Awarded by the Public Relations Society of the Philippines (PRSP), the Gold award honors TELUS International Philippines for the outstanding and sustainable execution of its TELUS Days of Giving program. The annual Anvil Awards is considered as one of the most prestigious award-giving bodies in the country’s public relations industry. “TELUS International Philippines operates with a social purpose. To be recognized for our efforts is a great honor for all our team members who unselfishly devote their time and energy to drive positive change in the communities where we live, work, and serve,” said Carlos Giammattei, TELUS International Philippines’ Director for Brand, Marketing, and Culture. For 2017, the annual TELUS Days of Giving benefited 9,005 students of Rosauro Almario Elementary School in Tondo, where team members came straight from a full night’s shift to refurbish the school’s facilities while sharing disaster preparedness, livelihood, and job interview skills to the surrounding community. The activity was initiated in conjunction with the Department of Education’s yearly school cleanup program, Brigada Eskwela, which the company had been supporting for the past four years. Weekly initiatives, meanwhile, included Play It Forward, Step It Forward, and Teentrepreneur activities, organized by team members themselves to impart the values of discipline, teamwork, and sportsmanship to underprivileged youth through a series of football, dance, and financial literacy sessions, respectively. “The TELUS Days of Giving here in the Philippines is a great reflection of our CSR philosophy, ‘we give where we live. It’s part of the organization’s caring culture and our commitment to giving back to the Filipino community,” Giammattei added. Criteria for judging include the overall organizational objectives and milestones of the company’s public relations program, the strategies the organization utilized to meet the program’s measurable results for its target publics, and the achievement of its PR objectives.